Unsurprisingly then, Qantas shut the operation down in 1955. 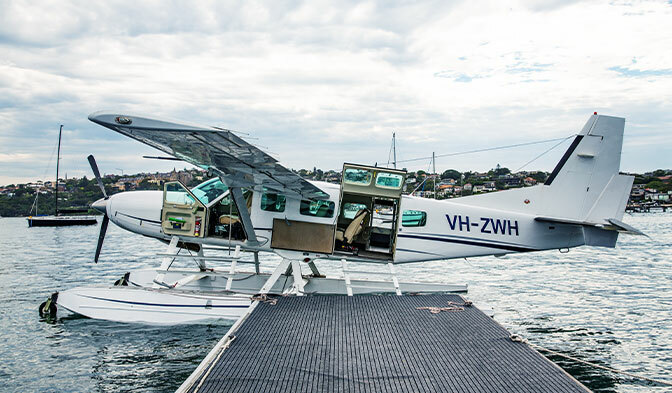 Sitting vacant until Shaw’s company – Sydney Seaplanes – took over the site a few years ago, it recently re-opened in 2016 after a massive restoration. Thankfully for us, today’s seaplanes have been retired from the long-haul shift and instead of island hopping our way across the Pacific, we’re on our way back from a four-course lunch at Bert’s Bar & Brasserie at The Newport. According to our pilot, the harbour’s north-easterly breeze means we’re in for a scenic landing – but more on that later. 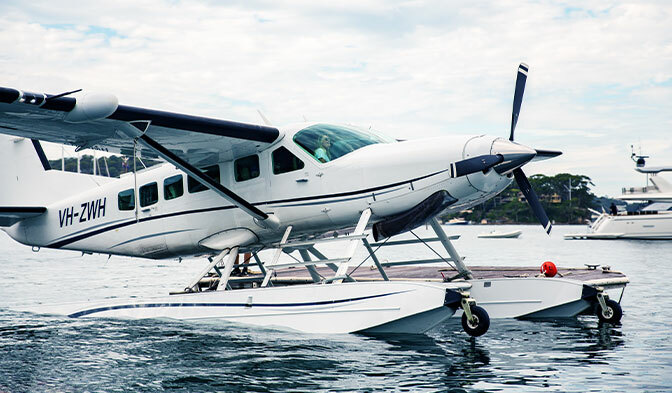 For just over a year now, Sydney Seaplanes has been delivering guests to Bert’s in style. Harking back to a bygone era, Bert’s is a masterstroke in nostalgia. 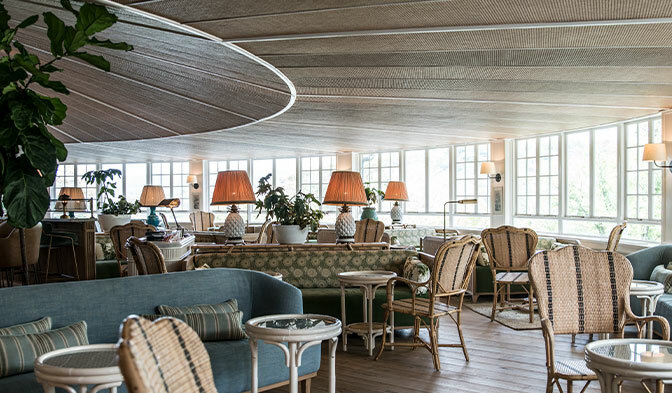 Echoing the class and style of the grand Mediterranean hotel dining rooms of the early 20th century, the space is carved from bright Italian marble and garnished with intricate woven cane textures. You can almost picture it having been transplanted straight from West-Egg to the northern beaches. Splashes of turquoise and coral bring warmth to the restaurant, which serves as a unique vista for the glistening Pittwater below. But the nostalgia doesn’t end with the fit out. 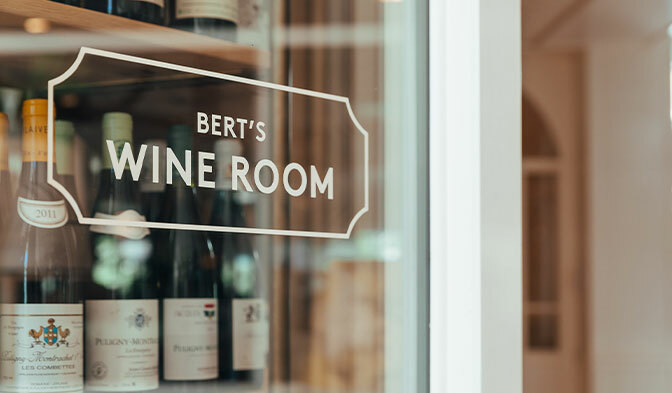 Marrying classic European flavours with the best in local and regional produce, chefs Jordan Toft and Sam Kane have crafted a fuss-free, yet elegant four-course menu bespoke for Bert’s air-faring guests. Freshly shucked local oysters come with a lemon and chardonnay mignonette and an obligatory glass of Veuve Clicquot. An equally great place to start is the grass-fed beef carpaccio, with a tangy salad cream and served with pickled chilli. From atop the ironbark embers of the Basque Josper grills comes the tenderloin main. The grass-fed organic beef from Brooklyn Valley in Gippsland, Victoria, is served simply with a lemon jus and soft garlic – Sam lets the produce do the talking. If the spoils of the sea are more your thing, the seafood bar is stocked daily with the finest quality fish and crustaceans. 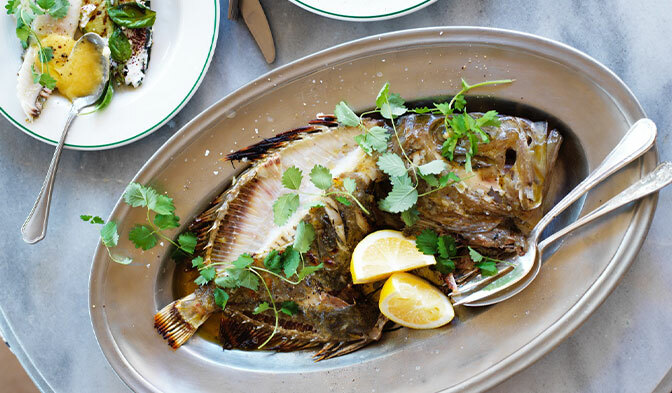 The fish of the day is served whole to share with a creamy hollandaise accompaniment. And then there’s the lobster. 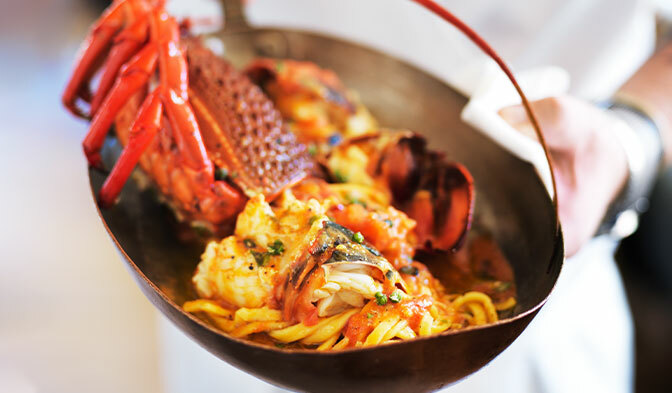 Served with a velvety white wine sauce and scented with a bittersweet marjoram foil, it comes tangled amongst a chewy hand-rolled tagliolini. It’s a show-stopper, and unsurprisingly the kitchen’s signature dish. To finish, it’s hard to imagine dessert at Bert’s without a serve of the Instagram-friendly frozen slice. 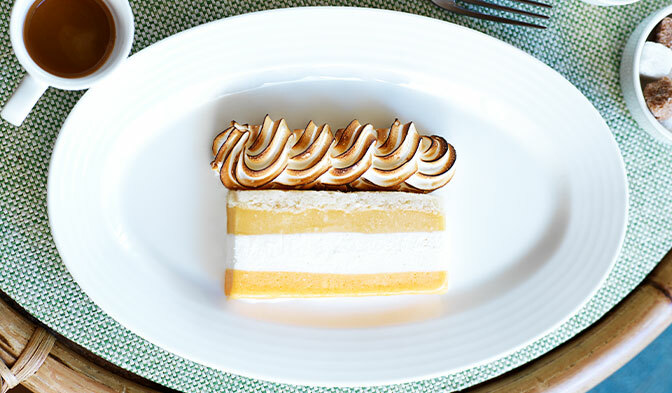 Layers of frozen yoghurt and seasonal berries make up what’s arguably Sydney’s most elegant ice-cream cake, and come topped with a fluffy burnt meringue. Oh, and did we mention the wine? Curated by Merivale Master Sommeliers Franck Moreau and Adrian Filiuta, the list features wine from some of the best producers in Australia and New Zealand, Italy and France without becoming inaccessible or impossible to decipher. And at 41 pages that’s quite the feat. After such indulgence, who has time for chores like driving, or deciding whose account you’re going to book the uber on? The short stroll down to the wharf to meet the seaplane seems like the only rational solution for our 40-minute trip back to Rose Bay. That’s where our story resumes. 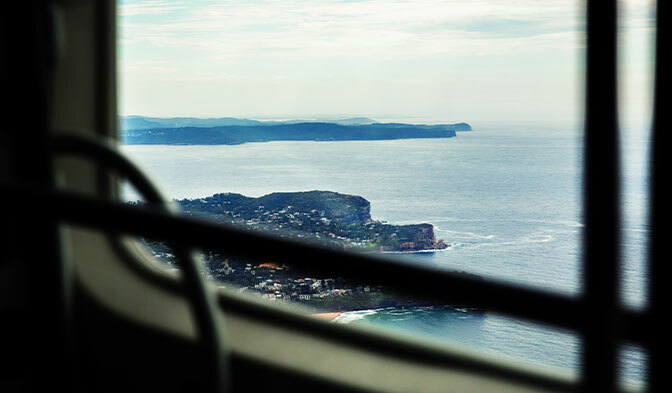 Flying in to Sydney Harbour, the Cessna Caravan we’re travelling in embarks on a circuit of the city’s greatest hits. Floating over Luna Park and back over the Sydney Harbour Bridge, we skim over the sails of the Opera House and skirt so close to CBD skyscrapers you swear you could reach out and touch them if it wasn’t for the glass window separating you. 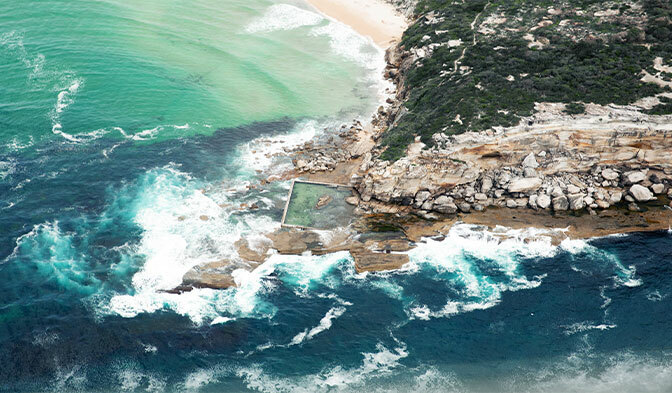 We glide over the Royal Botanical Gardens and catch glimpses of swimmers diving into the glassy blue water at Boy Charlton Pool before our pilot sets his trajectory for the soft landing between the yachts and sailboats bobbing away in Rose Bay. As far as Sydney transport goes, this is pretty hard to top.